“there is nothing wrong with you“? Were you ever told that “they are all in your head” ? and that you needed “to take it easy” ? I can relate, I’ve been there. So what is really wrong? Surely the symptoms are not just in your head? You are feeling the pain and numbness, aren’t you? Sometimes there are tingling and crawling sensations under your skin. You are feeling extreme fatigue and lacking energy. You have that pounding headache and migraines that make you want to hide in the dark. You don’t remember when was the last time you had a good night’s sleep. You have unexplained gas or bloating and stomach cramps after you eat anything. You experience chronic constipation, sometimes diarrhea; it prevents you from traveling, for fear of not having easy access to washrooms. Constant belching and flatulence is a social embarrassment but you don’t know what to do about it. These are amazing individuals who otherwise have a lot going for them. They have a family that loves them, a great career ahead of them, but due to their symptoms, they are not able to give back more than they would like to. Some of these symptoms can be debilitating and incapacitate them on some “low” days, and they would never guess what hit them. Do these all sound familiar to you? on the right track to healing your body from the inside out. As your Personal Health Coach, I will be working one-on-one with you. I will do a complete assessment on where you are at with your health, and customize a healing program just for YOU. You will receive undivided attention from me where I listen to every little detail you share about you. Every detail is a clue that will help with your healing. I will provide you a safe place to share without judgment. All that we discuss will be treated with the strictest of confidence and will not be shared with anyone else without your consent. The coaching program will be done completely online, via Skype Video, from the comfort of your home. Wherever you are in the world as long as you have an internet connection, we can connect. There is no traveling time involved. Your personalized program will radically improve your health and happiness. Together, we will explore/discuss concerns that are specific to YOU and your body. This program works well if you want to clean out your diet, and heal from a chronic disease or pain that has been bothering you for far too long. The above are some of the common ailments/symptoms that I have successfully helped my clients with, by coaching them to improve on their diet/juicing and lifestyle. Your health is in your hands. The more you are involved and participate in the program, the more you will get out of it, and the faster your healing. It takes time to heal, so the duration of this program is sufficiently spread out. You may add on months at the end of the program if more healing time and coaching is required. And … imagine, in only three months, you will feel a tremendous improvement to your health, and reduced pains, allowing you to do things that you have not been able to do for so many years now. Traveling, jumping, dancing, sports … what do you see yourself doing when you are feeling much better in three months? We will do an initial Health History to better understand where you’re at with your health currently. You’ll work through a very detailed Nutritional Assessment that will give us hidden clues of your nutritional deficiencies that are the “unknown” causes of your symptoms. We will plan your dietary/supplements accordingly based on these findings, to speed up your healing. Help you identify your health goals and create your beautiful life. You will get to set three priority goals of your top health concerns, and throughout the entire program, we will focus on these goals and work together to achieving them. We will discuss and carry out healing strategies and a program tailored just for you, and work around your preference and lifestyle. You will do a total gastrointestinal cleanse that will be the most important part of the program where it will help improve your digestive tract health, immune system and overall wellbeing. You will learn how to listen to your own body and find out what works for YOU. You will learn how to look out for, and manage healing reactions as you improve your diet. We will work out easy do-able physical exercise that is suitable for you. Help you plan your healthy meals and crowd out unhealthy food cravings. Provide you with tips and articles on healthy foods and their preparation and how you can integrate them into your and your family’s healthy diet. One-on-one 50-minute coaching sessions held once a week for the first month, then once every other week for the rest of the program. Ongoing analysis of your progress with recommended tweaks and changes where necessary. Detailed recommendations and checklists sent to you via email, after each session. A Health Coach to hold your hand through this “scary” journey that can also be very lonely. Cheer you on and motivate you. You don’t have to walk it alone. Email support, check-ins and motivation between sessions to keep you on track. are pregnant, just delivered your baby and/or are nursing. just underwent a major surgery. have cancer and are on chemotherapy, radiation and medication. are not willing to learn to prepare your own wholesome healthy foods. are expecting to get well overnight. It takes time for your healing and three months is a good enough time to gauge that you are getting better. who motivates individuals to cultivate positive health choices. their health goals through diet, lifestyle and behavior adjustments. Why Work With Health Coach Sara? I am not only a Health Coach but also a Nutritional Consultant, and have experience working with clients to successfully recover from digestive issues. I bring with me the latest nutrition information, tools and resources to guide you towards a whole foods lifestyle for optimum physical and mental health, and wellbeing. I believe in helping you to reconnect with your body’s intelligence, nourish it with the right nutrients, and allow it to heal on its own. I will teach you to do a gastrointestinal cleanse, simple juice cleanse, eat the right foods, and with the help of a few targeted supplements, all tailored to suit your nutritional needs. You will soon be on your way back to health! Perhaps, most importantly, you will have someone who’s been there and understands, to look at the overall big picture, identify problem areas, know what nutrients you are deficient in, and tell you which areas of your health need focus NOW, and HOW. I believe that not every body is the same, so what worked for me may not work for you. I will teach you how to listen to your own body and find out what works for YOU. Let me walk with you for three months (or add monthly coaching thereafter – optional*). I will teach and empower you so that you know what to do for yourself beyond our coaching sessions. After two months, I did a stool test and saw that there were no more parasites! That was a huge game changer for me, and made me very, very happy. I am now able to live a life where I don’t constantly feel bad after eating foods that I like. I have completely changed my diet and learned a lot of small tricks here and there, that have now changed my life forever and that I continue to use in my every day life. During the program I failed a few times, but she didn’t give up on me and encouraged me to keep going when things were tough. What I liked best about working with Sara is that she viewed each appointment as a teachable moment. At our very first appointment, Sara said that her goal was to make sure she equipped me with the right tools so that by the end of three months I wouldn’t need her anymore. That really stuck with me. Sara did a great job of adding new things in phases, so I wouldn’t be overwhelmed and had time to adjust and experiment with what worked best for me. She also always provided several options but was honest about what would work best: “You can do it the easy way or the hard way, the hard way is best, the easy way takes longer”. By the end of our 3-month program, my energy had increased dramatically, my sleep couldn’t be better and my skin looked amazing. I also felt lighter and less bloated. Just about a week or two into the program, I felt a certain calm in my gut and my mind that I hadn’t felt for a long time. I was happy to know that I’m now in control of my life and will be able to overcome the helpless feeling of being on medications as my life sentence! It was an emotional moment when I went off the diabetes and cholesterol medication after my blood tests had returned normal. My Ayurvedic doctor had declared that my body is now balanced and that my body’s three doshas are in equilibrium. Towards the end of the program, I was even able to stop two of my hypertension medications and my blood pressure was normal. This was due to Sara gently pushing me to work with my doctor to wean off the medications. I was suffering a severe allergic problem due to which doctor had suggested me to undergo a nasal bone surgery. After our first meeting, Sara immediately identified the offending foods in my diet that although I craved, were causing my misery. She explained to me why I had to stop eating them, and offered healthier alternatives. I did what she advised and for the first time in years, my sneezing actually stopped and I could breathe well. At the time of writing this testimonial, I am happy that I don’t have to undergo the nasal bone surgery, my allergy problem is cured 90%! I feel amazing! I cannot believe how much we have accomplished in so little time. If I had contacted Sara earlier, I would have spared myself so much pain! Now, my situation is reversed. I not only have days, but weeks without having to worry about stomach problems, and it is an awesome feeling! I have more energy now and have gone back to training at my local gym. My social life has also improved as I am able to go out more without having to worry about running to the washroom all the time. What I like most about the program is that I get a written summary from Sara after each talk. This helps a lot, because even though I write my own notes while we talked, I tended to overlook details or small things. On top of that, she even wrote more tips and suggestions in the summary that I could easily follow. I highly recommend Sara to be anyone’s Health Coach! This is my first experience with a health coach on Skype, and it has been great! Sara has an awesome range of recipes and information both on her website and her Facebook page! After only two months into the program, my skin was able to readapt itself again to sunlight. I no longer break out into difficult, irritating and itchy red patches on my face and body as I did before. An added bonus is that I am now much more healthier, much more energetic and much more dynamic than I was before I started the program with Sara. I would describe Sara as someone who is driven by a genuine desire to serve people who are less fortunate than her. That is her core quality, and she tirelessly leads people to a better and healthier future based on this principle. She draws strength and determination from this belief and exudes a quiet confidence which is borne from years of experience and knowledge. Sara is the ideal personality for any candidate as a natural healer. Her personality is soothing and calming. Simply said – she was born to heal. The most significant moment of the 3-month program was when I realized I didn’t itch as much from eczema. I was euphoric and beamed with delight on this newfound therapy and my very supportive health coach. With that positive effect, I was more confident and determined to complete the rest of the program. I have more energy especially when I followed the routine more regularly and diligently. Health-wise, the inflammation from the eczema subsided although the itch still persists on and off. Overall, it’s definitely much more manageable and the itchiness was reduced by 70-80%. As an avid Juicing Consultant and Health Coach, Sara displays adequate and sound knowledge in guiding me through my treatment. She was very supportive and encouraging especially when I was too busy to continue my detox due to my busy work schedule. She encouraged me to persevere as I later realized that before I can achieve a work-life balance, I need to balance my health and work. I highly recommend Sara Ding to those who needs the extra boost for guidance and support when going through the difficult healing period. As we work together and do our best to get you well again, there is no guarantee how much your improvement will be. As long as you are actively participating in the program and do all that needs to be done, you WILL see some results. But, if you don’t improve AT ALL at the end of the 3-month program (which is an extremely rare possibility), I will refund your money, less $200 for administration fees. 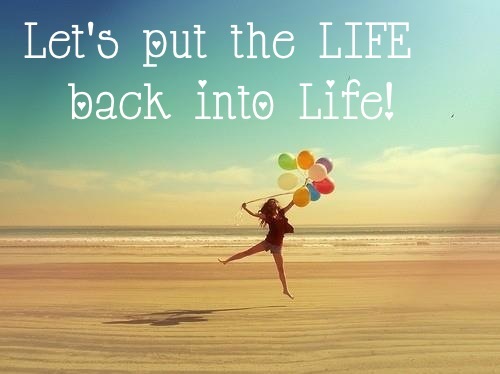 … to put the LIFE back into your Life? … to have more ENERGY and feel Great? … to JUMP and DANCE and shout “NO MORE pain!”? At this point, you may be thinking, “This all sounds amazing, Sara. If you are ready to go on a deep, sacred journey to transform your relationship with yourself, your body and with food, go ahead and book your FREE 30-minute consultation, by completing the Health History Form. Be as thorough and complete as possible. The more information you provide, the better the outcome will be! Take me to the Health History Form! OR if you have more questions, send Sara an email.